Had to buy this in the charity shop after seeing how many copies Lucycat has bought to share and how much she loves the book. Will be on TBR pile for a while - but then destined for RABCK or release. My Dad and friend Bebbie would like to read this - lets see if they can journal it themsleves !! Then this will be made available to person who shouts quickest and shoots the straightest arm in the air! This has been requeted by violetaparra so when I get it back from my family I will send it over. Released on Friday, February 27, 2004 at RABCK in n/a, RABCK Controlled Releases. My friends and family have read the book. Bebbie and my Dad really enjoyed it. My Mum tried it but couldn't get on with it - so she returned it to me. Off across the pond as a RABCK - I hope you enjoy it! I've never seen Tony Hawks do comedy, which presumably is his profession, but never mind that. This book of his is howlingly funny. I read it on my commute to and from work, where people stared at me as I giggled, snorted, and generally made all sorts of other non-commuter-appropriate noises while I read it. It's also a great intro to some of what is truly wonderful about Irish culture: an appreciation for the bizarre, an appreciation for people's company, and some really wonderful vocabulary (it took me a good 100 words to figure out what the actual spelling of 'eejit' is). 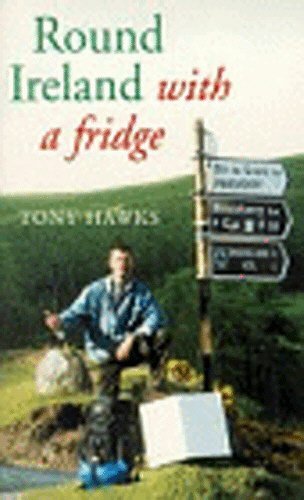 Hawks's self-deprecating humor combines with his outsider-turned-superstar status as Fridge Man to paint a warm picture of modern Ireland and the joys of the fridge philosophy. Weebly, thanks so much for sending this book across the water to me-- somehow it fits with the general silliness of it all that your copy travelled all the way here for me to read! Where shall we send it next? Next it's back across various bodies of water for our little paperback fridge, as it (did they ever determine what gender it was?) travels to the Netherlands. Have fun, Biba89! Finally, the fridge continues on to the Nederlands. Have a fine trip, little fridge! Watch out for eejits! Thank you, Weebly and Violetaparra, I just finished a book this morning so I can start reading right away! And we will beware of the eejits. Mind you, for those of you who have been introduced to Irish speak, you might want to continue this lovely banter with some of Roddy Doyle's novels, of which most have been been into film. Especially worthwhile are The Van, the Snapper and of course, the Commitments. With an abundancy of kitchen appliances, and in The Van they are travelling, too! Youy will hear shortly about my findings with the traveling fridge-of-undetermined-gender. I have read it in one day! It was deeply satisfying, utterly amusing, very readable and made me want to go to Ireland this instant. The Irish culture seems to harbour a general appreciation for people doing silly and outrageous things, just for the fun of it. The appreciation was expressed in all the unexpected kindness, generosity and hospitality Tony encountered on the way around Ireland. A bit like bookcrossing, really. He made it, his bet, and the fridge even went surfing, too. i will promote this wonderful book on the Dutch forum, see if i can make it into a ring. Allright, there are applicants for this appliance already. This book will travel around the Netherlands and who knows even further, hitch-hiking along with officers from the postal service. Klaartje, here it comes! Finally! Ahh, the Fridge ring is here! Looks like I'm going to enjoy this one. Thank you, Biba! This one made me laugh out loud. Not many books do that. Tony may have to rethink his attitude towards women, though. Or they'll never call him back. Received this book in the mail while I was on a holiday. I'm currently reading it. Not ROFL-ing yet, but it's ok.
Uhm, I didn't enjoy this book as much as its previous readers. In fact it didn't make me laugh at all. It might have been Tony's humour which is probably not my kind of humour at all. I totally agree with Klaartje's comment "Tony may have to rethink his attitude towards women, though. Or they'll never call him back." hahaha! The book did confirm my feelings that I will have to visit Ireland in the near future. It's not that far away, and it certainly doesn't rain that much more than here :) It sounds like a wonderful country. Off to its next reader. Finished it already! It was a funny book. Thanks for making this a bookring. its travelling to Plinius today. I forgot all about this ring, a real surprisepacket, thank you Gala! I liked this book. I enjoyed the descriptions of the Irish and their reactions to the fridge adventure. And I agree with Klaartje about Tony's attitude. But nobody calls back a stray tomcat, unless looking for trouble. Looking forward to read the book, don't know when yet, I really need a vacation to read read read... As soon as possible of course. This book was hilarious! Very funny and absurd. I think Ireland is about the only country were you can pull off such a stunt; I found it incredible how people would offer him free drinks, lunches and a place to stay! I liked his humour very much (the way he describes his adventures) and the book made me laugh out loud at times. His love for Ireland seems genuine, though I thought the last chapter was a bit over the top, almost too sentimental. All in all, a very enjoyable and readable book and it definitely makes me want to go back to Ireland this instance! For now, this book is going to Willemijn today, enjoy! Sorry, sorry, ik heb dit boek al een week in huis en nu pas een melding. Ik ben er gelijk in begonnen. Heerlijk! I'm ever so sorry, I got this book more than a week ago and waited untill today to post an entry. I started the book right away. It's fun! But life got me tightly in its grip, these days. No time to read at all. However, this book will be read some day soon. I hope. Maaike zie ik morgen en ik zou graag van deze ring af. Niet omdat het me geen leuk boek lijkt, maar mijn tbr is gewoon té hoog en dit boek blijft maar goede tweede. Dat kan zo nog maanden duren. En er zijn nog zoveel achter me. Ik hoop dat ik in mag breken in de volgorde: als Maaike nu kriskras bedient, komt het allemaal weer terecht. Willemijn gave me the book at a wonderful Halloweenparty with lots of alluring books that all whispered 'take me home, take me home'. Of course, I couldn't resist them, so Mount TBR threatens to topple over now. But first, I'll have to read my ringbooks. I have three or four (I don't dare to look) waiting, so this one will have to wait a little before I'll take it for a ride. It must be used to that by now, being a hitchhiker. I leafed through the book this weekend, but I'm not in the mood for funny books. I have decided to send it on. Sorry! Aangekomen in Gouda. Wellicht dat Mumtotwins het eerder gaat lezen. Kan ook makkelijk, want we wonen samen. I liked the book, though not as much as I expected/hoped. I guess Tony Hawks is funnier on TV than as a writer. Twinfather heeft besloten het book niet te lezen, dus kan hij door naar de volgende: Powerhouse. It's one of those weeks: the books keep pouring in. Blissful bookcrossing! This one has to wait a bit I'm afraid, although I could do with something 'howlingly funny' as violetaparra puts it. Thanks everyone! It's one of those weeks: the books keep pouring in. Blissful bookcrossing! This one has to wait a bit I'm afraid, although I could do with something 'howlingly funny' as violetaparra puts it. Thanks everyone! PS: just noticed kriskras was skipped, I'll send it to her first after finishing. Well, Mr. Powerhouse read it and thought it was hilariously funny. He kept reading aloud what he thought were the most funny parts so I guess I already got an impression that is quite satisfactory. I will therefore not read it myself, but send it on to EmEli. I received the book this afternoon and immediately started reading. I really liked 'Playing the Moldovans at Tennis', Tony's other book, and this one seems promising so far. Thanks! Edit: I will send the book to kriskras. Tony and his fridge savely arrived on Saturday morning. I'm going to make my own round of Ireland in July - instead of a fridge I'm taking my husband though ;-) - so I'm really curious to read about Tony's adventures. Thanks! It took me a while, but yesterday I finally found the time to read about Tony's trip. The book is laugh-out-loud funny, Tony has a gift of describing the people he meets in a hilarious way, without making a monkey out of them. I appreciate that! It seems that Tony and the Fridge have woven their route through the ring list and came back to me. Only to be requested again, by Arja. I will see to it that they get there safe and sound, albeit a little battered. Just like the fridge, I reckon. Can't wait to read this, but will probably have to--until I return from the US in 5 weeks. If I weren't trying to get other BC books read so I can release them in the States, I would, of course, drop everything and read it right now--the temptation to do just that is great, but I will resist. I know an Irish woman who, if she hasn't already, would probably get a kick out of this. Maybe I'll loan it to her while I'm gone--I keep trying to make a BookCrosser out of her--but so far, no interest. This might do the trick. Thanks, biba! Oh come on. Who am I fooling? I'm never going to finish this book. Although I find Tony Hawks a funny witty man on the BBC, I just never really got into this book--plodding through the first few pages felt like carrying around a refrigerator on my back. So at last, I've finally pushed it out the door to Arja, the next person in the ring. Terribly sorry to have held up the ring for so long. N. B. Nothing like reading previous journal entries AFTER submitting my own. Guess there must be something wrong with me (and Silvertje . . .). Everyone else seemed to find it hilarious. If it ever crosses my path again I'll give it another try. yay, another ring book on my door mat. it will join its friends on Mt TBR for a bit, until I find the time to read it. great sense of humour, had a good time reading this book! Wow -this is an old one! It was the first ring I subscribed to and in the mean time I happened to find the Dutch translation in my local charity shop, which a read for a year ago. That book was a pocket without pictures, so I will browse through the book a bit and then send it along to the next reader. Gevangen! Frakke-Per, bedankt voor het opsturen. Ga 'm binnenkort lezen. Thanks very much for sharing this extraordinary book! I'll be sending it back to Biba a.s.a.p! The fridge & Tony have arrived back in my place, after some considerable journeying through the Netherlands. Let's see if I can find a new destination for them. Gevonden in OBCZ de Ulebelt: meegenomen vanwege de hilarische titel! Ga het zsm lezen. Found in Deventer: took the book with me because of the hilarious title. Look forward te reading it soon.